Cat furniture like scratchers, appropriate climbing surfaces, places to hide for a quick nap, and places to perch up high! Condos, trees, towers & perches in all shapes, sizes, colors, and looks. 1-2-3 Pet Steps It's two step heights in one! 48-inch Kitty Palm Cat Tree A cat tree straight from Florida to your home! 72-inch Kitty Palm Cat Tree The perfect tropical cat tree for larger rooms! 80-inch Kitty Palm Cat Tree Pool enclosure? Now your kitty can enjoy it with you in his very own cat tree! Aristocrat Scratcher Lounge For your sophisticated kitty! Bella Cat Sofa & Scratcher This is one sofa your can CAN scratch! Butterfly Scratcher Lounge Available in Green or Red! Carpeted Cat Scratching Post Available in 3 heights! Cat Comfort Couch What cat doesn’t love a comfy couch? Cat Power Tower Earth-friendly, versatile, and beautiful, too! Cat Shelves for SunCATcher Enclosures Additional shelves for your outdoor cat enclosures, in carpeted or natural cedar finish! Cat Walk for SunCATcher Enclosures Available in 5 lengths to connect elements within your SunCATcher Enclosure! Caterpillar Scratcher Lounge An adorable outlet for a natural behavior! Catitude Carnival Cat Tree Bored kitty? Try this! Catitude Salvador Cat Tree Surreal! Catitude Tower Cat Tree The tallest of the Catitude line of cat trees! Cedar Triple Tower Cat Tree Solid cedar, for indoor or outdoor use! Configurable Pet Crate-Gate Available in two sizes! Cosmic Cardboard Cat Scratcher Got a cat who likes to scratch your carpet or the top of your sofa? Here's the right scratcher for him! Cosmic Double Wide Cardboard Cat Scratcher Treated with Cosmic Catnip, what cat can resist this? Crab Cat Scratcher Earth-friendly and made in the USA! Crocodile Cat Scratcher Available in 3 sizes! Crystal Tower Cat Tree Almost 6 feet tall, in indoor and outdoor versions! Designer Stairs with Removable Cover Help your older, arthritic cat reach his favorite spots! Designer StRamp with Removable Cover A little help for your older cat or tiny kitten! Easy Step Helps your older or disabled cats up onto a chair or sofa! Easy Step Bed Stairs Great for aging cats, or breeds with shorter legs! Fins 'n Feathers Nesting Cat Scratcher Duo Comes with feather wand! Fish N' Chips Cat Scratcher Kitty an Anglophile? Here’s his scratcher! Flip the Dolphin Cat Scratcher This friendly dolphin could become your cat’s best friend! Football Combo Cat Scratcher Two scratchers in one! Giant Christmas Tree 2-in-1 Cat Scratcher Made in the USA of 100% recycled materials! Giant Purr-fect Stretch Cat Scratcher Lounge Over a yard long! Halloween Hanging Cat Scratchers Your cat will have a frighteningly good time with one of these! Hammock Loft Cat Cottage Kitty will think he's on vacation! Hanging Cat Scratchers Available in 11 designs! Hangin’ Cat Condo Available in two widths, and perfect for multiple cats! Holiday Express Train Cat Scratcher Get your cat in the holiday spirit with this scratcher! Iguana Cat Scratcher Small, medium, and large sizes available to suit cats of all sizes! KatKabin DezRez Outdoor Cat House The perfect house for your outdoor cats. Kitty Cabana Cat Tree A golden, fleecy kitty heaven! Kitty Club Chair with Ottoman Comes with its own mini-scratcher ottoman! Kitty Condo Attachment for Kitty Palm This condo attaches to the base of any size Kitty Palm! Kitty Palm Cat Scratching Post This scratching post brings a taste of the tropics to your home! Kitty Sleephouse Wild leopard print in heated or unheated! Kittywalk Carnival A combination of the CAROUSEL and the FERRIS WHEEL with a connecting sleeve making both accessible to each other. Kittywalk Curves Add variety to your Kittywalk system! Kong Cat Naturals Scratcher Made with renewable resources! Lazy Pet Kitty Pyramid Will accommodate large size cats! Love Bug Combo Scratcher A big scratcher for your Love Kitty! Mouse & Hedgehog Nesting Cat Scratchers Two scratchers in one! Nifty Contoured Scratcher Lounge Available in 3 patterns. Outdoor Kitty House Keeps kitty safe and warm outdoors! Outdoor Multiple Kitty A-Frame Available in heated or unheated models! Peek-a-Boo Cat Cottage Now kitty can have her own little house! Reindeer Dual Cat Scratcher Your cat knows that Christmas is a special time; help her celebrate with this! Roller Rink Cat Tree Over 6 feet of hideouts and towers! Room With a View Outdoor Cat House Cats love the rooftop balcony! Rub N' Ramp Cat Scratcher Available in your choice of 3 lovely patterns to complement your décor! Scoop Cat Sofa Contemporary shape for your stylish kitty! Self Warming Kitty Sack Available in Leopard or Zebra prints! Sisal Cat Scratching Post Available in 3 heights! Sleigh Cat Scratcher Lounge Eco-friendly holiday cheer! Small Dog Cat Scratcher A doggie friend for smaller kitties, in Dachshund or Beagle! Small Purr-fect Stretch Cat Scratcher Lounge Available in 3 patterns to complement your décor. Small Round Pumpkin Combo Cat Scratcher Two scratchers in one, for smaller cats! Small Tiger Cat Scratcher Great for smaller cats and kittens! Soccer Ball Cat Scratcher Doesn’t your cat need his own soccer ball to kick around? Squished Pumpkin Combo Cat Scratcher Lounge Two Halloween scratchers in one! StRamp from Pet Gear Helps smaller or aging cats up off the floor! Super Catnip 20-Inch Scratching Post Give your kitties an alternative to your furniture! Tarzan Cat Tree In indoor or outdoor versions for your swingin’ kitty! The Posh Cat Scratcher Lounge A toney piece of furniture for your cat's living room! The Vogue Dual Cat Scratcher Lounge Two scratchers in one! Thermo-Kitty Cabin Form into 3 bed shapes! Triple Purrs Scratcher Three types of fun, in one scratcher! Two-cans Nesting Cat Scratcher Two scratchers in one! Valentines Chaise Scratcher Earth-friendly and made in the USA! Valentine’s Day Purrfect Stretch Scratcher What feels better than a good stretch? Whale Cat Scratchers Available in 3 varieties of whale and 3 sizes! Window Mounted Cat Lounge Seat No need to drill holes in your walls - perfect for renters! When you click on the products below, another tab will open in your browser and take you to another retailer's site. 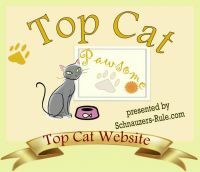 You may not use Old Maid Cat Lady gift cards or discount codes on their sites, nor will any portion of your purchase be donated to our Cat Champions. They pay us a small referral fee for sending you over, and we include these products in the interest of completeness, to make them available to you when we don't have a direct supplier for them. Click on the image above for details and pricing. Click on image above for details and pricing. Cat Condos & Houses Just like us, our cats need places to get away from it all for some quiet time or a little snooze. Indoor and outdoor cat houses and condos give them little "hidey holes" to do just that. Cat Perches & Shelves Cats like safe places to perch up off the floor. We have perches for window mounting, wall mounting, or free-standing perches to give kitties plenty of safe places. Cat Scratchers To keep their front legs healthy and toned, cats need to scratch. These fine scratching posts and pads in materials like sisal, carpet, and corrugated cardboard keep them from scratching your furniture and carpets! Cat Trees Most cats like to climb and perch in a high place. In our broad selection of cat trees, you'll find something to please both you and kitty!